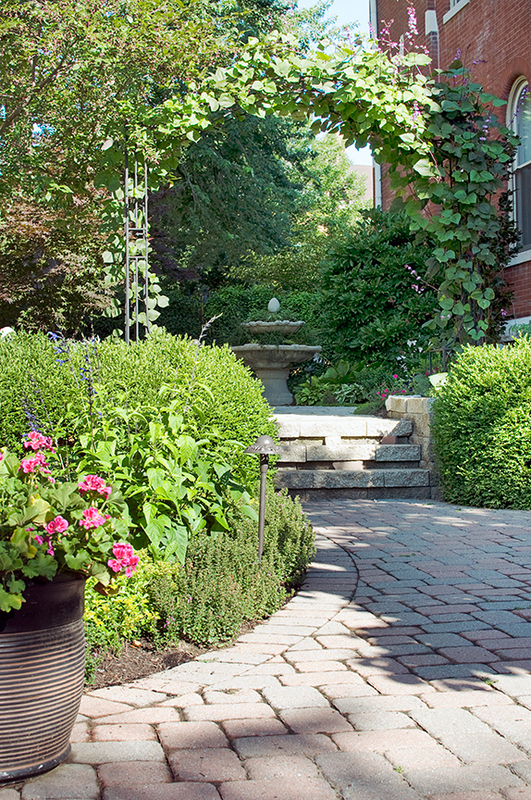 Moving to Soulard posed several challenges for garden enthusiasts Connie and Lynn Suydam. When Connie and Lynn Suydam considered a move to the City of St. Louis, Connie had one requirement. “I had to have a place to put my fingers in the dirt,” she says firmly. That was back in 1999, when Lynn had accepted a job as president of St. Louis Community College at Meramec. The couple, who had previously lived in Swansea, IL, decided a move to the area served by the St. Louis Community College system was in order. The Suydams looked extensively in Webster Groves and Kirkwood, both close to Meramec Community College but not too far from Belleville, where Connie worked as a hospital pharmacist. While they loved the charm of the older homes, they missed the conveniences of the new home they had in Swansea. When their agent suggested a renovated property in the city, Connie was dubious. But when she saw the 25-foot wide, brick townhouse in Soulard, she was hooked. The couple selling the property had totally renovated the interior space, while preserving much of the historic millwork and detailing. Even more exciting, the house sat on a double lot, which meant that on the south side of the home, a 25-foot-wide and 125-foot-deep patch of green space and dirt awaited Connie Suydam’s fingers. The wrought-iron gated space already had a bit of a garden with a flagstone patio and a fountain, but there was still plenty to do. In addition, there were particular challenges posed by the enclosed urban setting. Challenge number one came when the stone wall at the back of the garden collapsed into the alley. Choosing to build it back only part way, the Suydams hoped to screen the back of the garden with evergreen shrubs. But planting proved to be tricky. The soil off the alley came complete with pieces of old brick and stone, rusty metal and broken glass. Every shovel full of dirt had to be worked through a 4-foot-by-4-foot wire mesh sieve and enriched with nutrients before it was fit to use. Challenge number two involved determining which shrubs, trees and perennials could thrive in the small space without overpowering it. The Suydams wanted an urban oasis not an urban jungle. Fortunately, they came across some high-powered help. Garden designer Mike Miller, best known as the host of KMOX radio’s Saturday morning Garden Hotline, was a Soulard neighbor and familiar with the urban conditions. Connie asked his advice and if he would draw up a plan for the fledgling garden. With an interest in both urban gardening and education, Lynn was asked to be on the board of Gateway Greening, the organization that helps create community gardens and green spaces throughout the area. 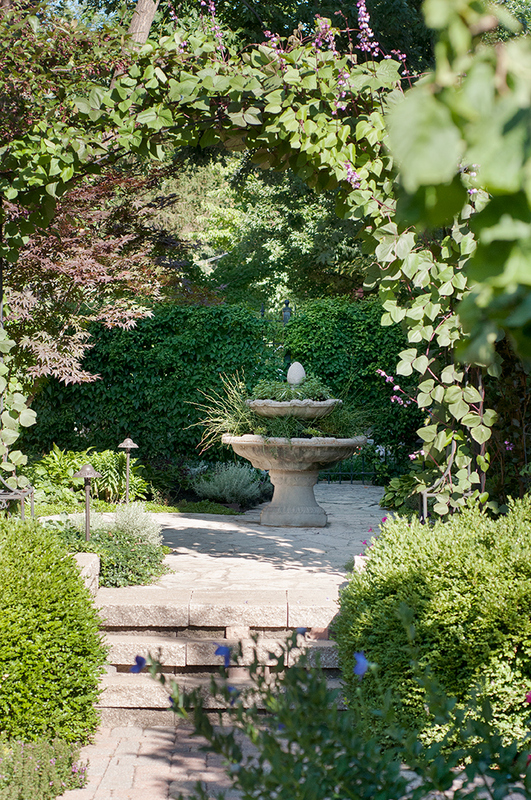 Bill Ruppert, executive director of the St. Louis Horticultural Co-op, also a board member, took an interest in the couple’s garden. He suggested that a vase-shaped Zelcova tree, native to southern Europe and Asia and a relative of the American elm, might be a nice accent in the Suydams’ small yard. The medium-size tree is adaptable, heat tolerant and works well in urban settings. 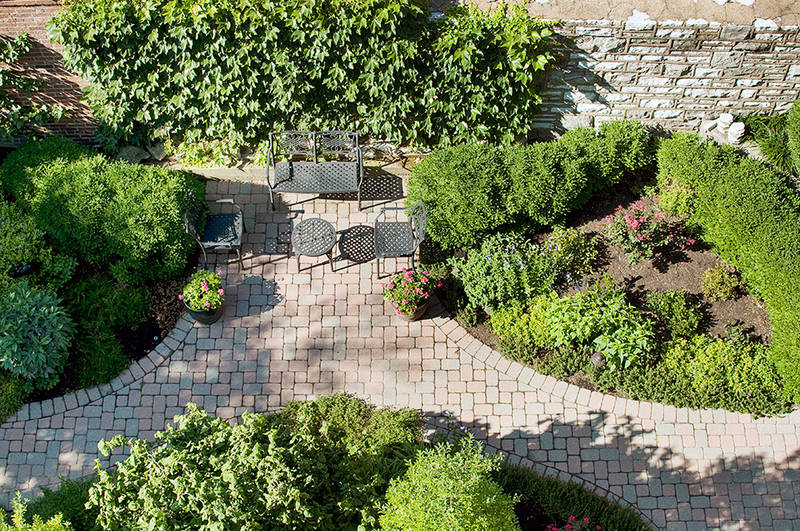 To provide constant green and soften the surrounding walls, Connie has added three Foster hollies, a cone-shaped blue spruce and numerous boxwoods. 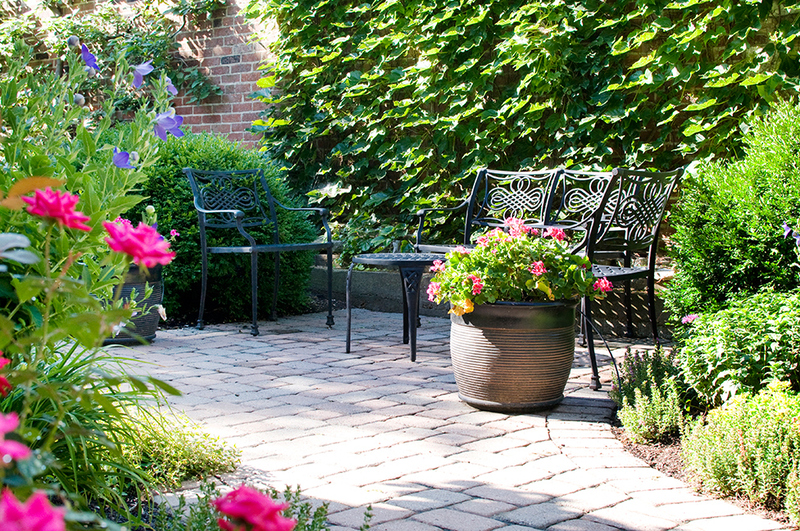 "After living in Virginia for a number of years, I just had to have boxwoods," she notes. A twisting contorted filbert, also known as Harry Lauder’s walking stick, is a favorite for its show-stopping architectural lines. With a thought to their moderate size, Connie also has added a “Prairie Fire” crabapple, star magnolia, burgundy-leafed “Forest Pansy” redbud and columnar purple beech. While it might seem that the land-locked, walled garden would have a common plant culture, Connie has discovered that identical plants...last fall it was asters…planted just a few feet apart can have a totally different growth rate. She also has discovered that some plants other gardeners consider invasive can be mainstays of her garden because they are totally controlled by the garden’s walls, walkways and foundations. In addition they have the ability to thrive in tough circumstances. Sweet autumn clematis covers the wrought-iron gates that open from the street into the garden. Groundcovers creeping liriope, with grass-like texture, and broad-leafed, trailing ajuga soften land-locked corners. Periwinkle (Vinca minor), tiny-leaved mazus with its purple flowers, and creeping phlox edge walkways. 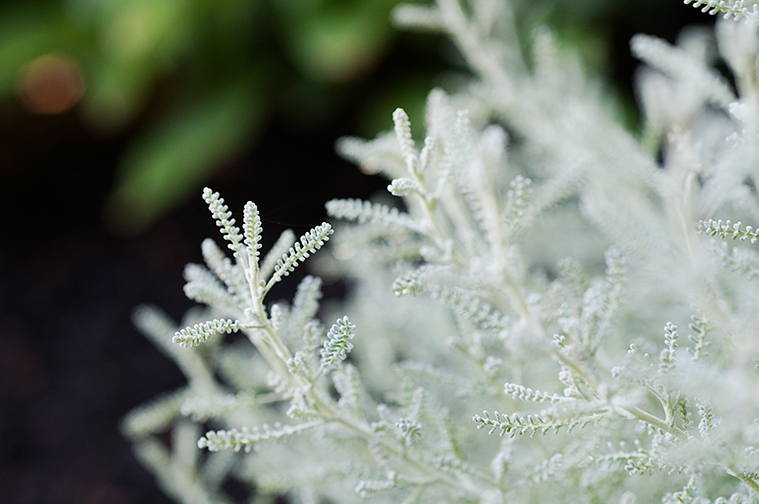 She loves the combination of lime green “Sum and Substance” hosta with blue flowered periwinkle and also is partial to the cool gray foliage of santolina and dusty miller. Connie’s interest in gardening has grown from the time she was a young mother with a 21-month-old child and newborn twins. 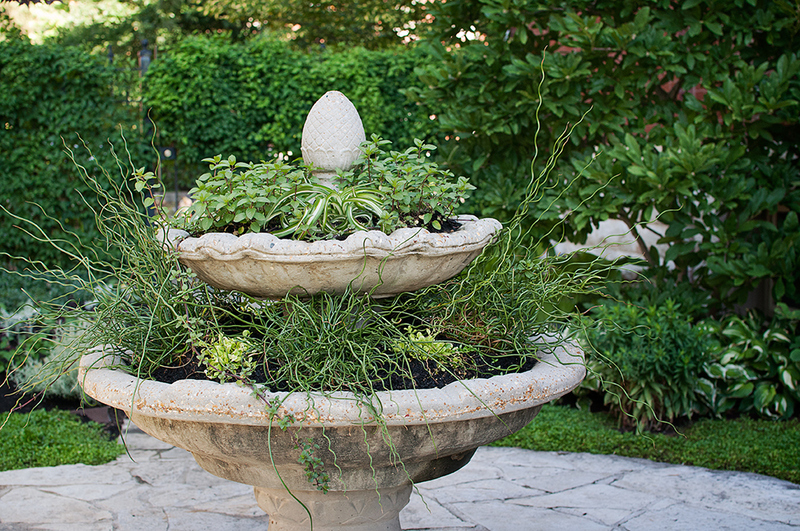 “We had help from our church and one of the women who helped and became a friend was very knowledgeable about gardens, so I had an appreciation early in our marriage,” she explains. That early appreciation has become a zeal with a famous family story about Connie using Lynn’s camping helmet with a headlight to finish installing bedding plants after dark. Like many gardeners, Connie loves being outdoors and “putting her fingers in the dirt” because she considers it therapeutic. 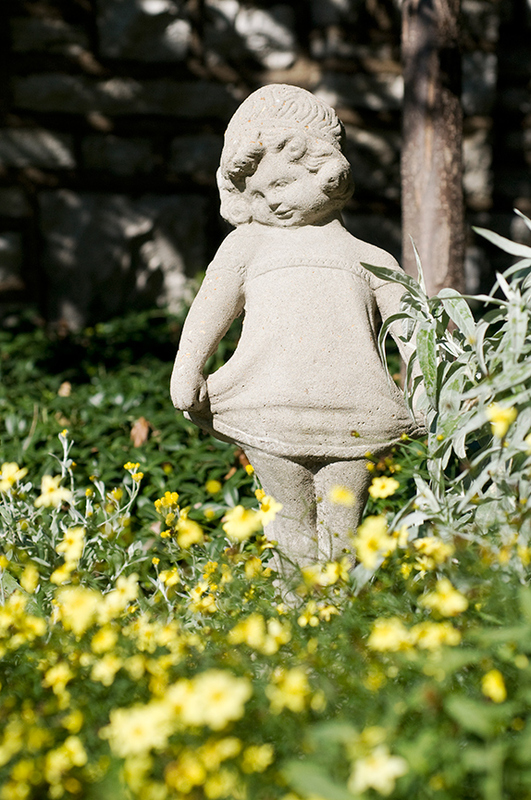 In addition to creating a beautiful oasis in the middle of the city, gardening simply makes her feel better.